Agave Mexican Bistro serves fresh, authentic and delicious Mexican food at its two restaurant locations in Newburyport, MA and Portsmouth, NH. Since opening, Agave Mexican Bistro has won several awards for its tasty and authentic creations and has built up a loyal base of customers to the north of Boston and all over the country! • Design and develop a unified and engaging web presence for both locations. Take a look. • Create a central Facebook page, upgrade design and claim “places” where customers “check-in”. 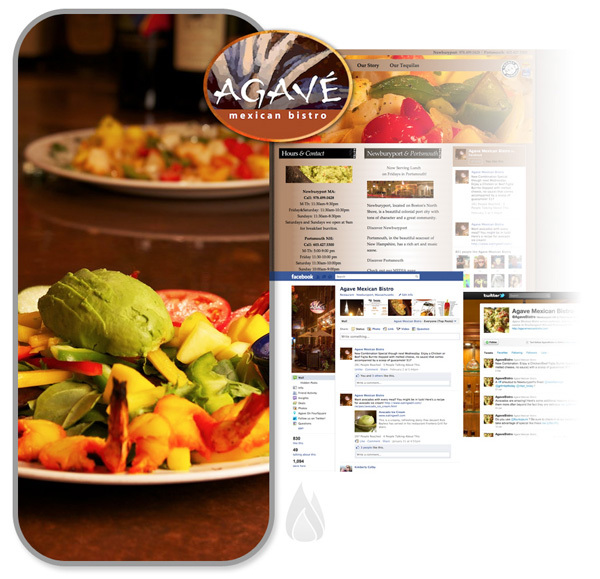 Start updating customers on stuff they want to hear about while sharing Agave’s unique personality. • Setup and create an engaging Twitter presence. Connect with the surround community while providing restaurant updates, deals and special events. • Claim FourSquare venues for the Newburyport and Portsmouth locations. Begin to provide check-in specials for each venue and learn from unique customer data. Hungry for similar results? We would love to learn more about your business and see how we can heat up your Internet presence. Feel free to drop us a line or give us a call at any time. Attending the 2011 eCoast Mobile Summit!